Mosh November 21, 2017 Tours/Live Dates No Comments on Four more for Bloodstock 2018 lineup! German metal legend, Doro will be the Friday night Sophie Lancaster stage headliner! With a career spanning over 30 years and 17 studio albums under her belt (including 4 with Warlock), Doro’s current label Nuclear Blast recently celebrated her 30 year anniversary with a 3 DVD box set, Strong & Proud; a great place to start if you’re not clued up on the Metal Queen. WWE wrestling star Chris Jericho’s band, Fozzy join Sunday’s Ronnie James Dio main stage line-up. Currently rampaging across Europe, the Century Media outfit dropped their seventh album Judas last month and have racked up more than 10 million views of the title track’s video. Ross was also suitably impressed with one of their recent live shows. Swedish death metal outfit, Bloodbath will lay waste to the main stage on Friday. Guitarist Anders Nyström tells us “After eight years, our time has come to put the Blood back in Bloodstock!” Not familiar with this supergroup featuring members of Paradise Lost, Katatonia and Opeth? Investigate their video for “Church of Vestitas”, taken from 2014’s Grand Morbid Funeral opus and ready yourself for their long-awaited return! Landing a Saturday spot on the main stage are Greek symphonic death metal squad, Septicflesh. First formed back in 1990, the pioneers unveiled their tenth record, Codex Omega in September. Record label, Season Of Mist are streaming the whole beast including a 360° video for “Dante’s Inferno”. Weekend tickets are still available in very limited numbers at an ‘early bird’ price (just £125 for four days of metal fun) so grab yours now at the ticket store if you want to save £20! To keep up with inflation and increased costs in 2018, standard weekend tickets with camping will increase from last year’s £139 to £145 once the ‘early bird’ allocation sells out. Camper van pitches are also available now. If you already know you can only attend for a single day, sign up for a day ticket reminder email as day tickets do not go on sale until next summer. 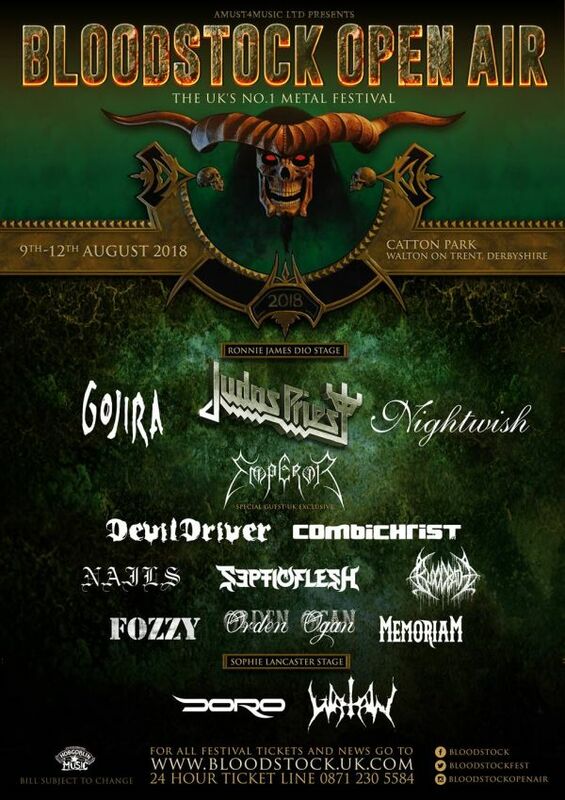 Register your day ticket interest here – https://www.seetickets.com/register/bloodstock.